Here’s my new, favorite fudge recipe. I love to eat it straight out of the freezer. Butter a 5×7-inch baking dish or pan and line with parchment or wax paper, leaving an overhang on two sides to aid removal. Butter paper also. Melt the butter and peanut butter together in a medium saucepan over low heat or on low setting in microwave for 1 to 2 minutes. Mix together well. In a second bowl, beat cream cheese to soften, and then beat into peanut butter mixture until blended and smooth. Stir in vanilla and sugar substitute. In another bowl, whisk together the whey protein powder, cocoa powder, and salt until blended. Sift dry ingredients into wet ingredients and beat until smooth. Stir in nuts, if using. 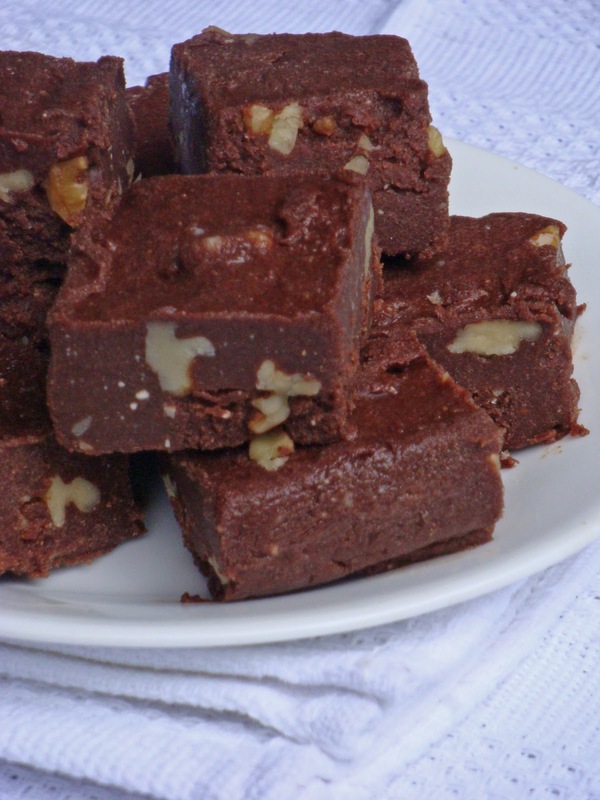 Spread fudge in prepared pan and chill or freeze until set. 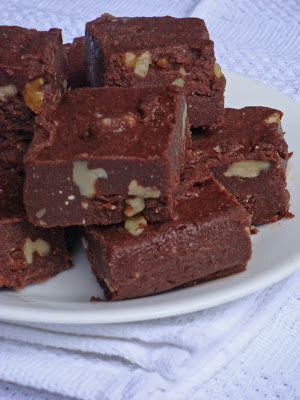 Remove fudge from pan and cut into 20 squares. (It is very rich, so I recommend keeping the servings small.) Store in refrigerator or freezer. May be eaten frozen. Chocolate, Fudge, Peanut butter, Popular recipe. Bookmark. Mmmm, I made this when ever i saw it as I was really needing something sweet and it is very good but it did turn out a wee bit grain like, maybe I should of put my erythritol in the coffee grinder first. I will still eat it as this has a very nice taste and very moreish. Thank you for your lovely recipes. Wow Judy! That looks so good! I usually use a high-intensity sweetener for this, but it should work with POWDERED erythritol. You will probably need a little high-intensity sweetener also to boost the sweetness if you just use plain erythritol. Let me know how it turns out! Thanks for the comments, Ginny and Jennifer! Thanks for telling me, Amy. I changed the recipe. In retrospect, I know what happened. I originally called for a "dash" of salt, or a "few grains" of salt, but the instructions for the book I'm currently working on said not to use those terms, to say 1/8th instead. That is probably OK for most recipes, but since this recipe makes a small batch, 1/8th is obviously too much. I haven't made it since I rewrote it with the change. Lesson for me: retest recipes everytime you change something! I'm so sorry you are having trouble. I've had other complaints that it is hard to sign up on my blog. I love having followers and hate to lose any of you. Have you tried using Twitter or Yahoo instead of google? My husband looked at the options and said those 2 look easier. I turned off the letter recognition feature, but blogspot still sends you through other places that have it. Does anyone out there have any advice? Some sweeteners don't work well without liquid or cooking, so perhaps we should stick to a liquid, high-intensity one for this recipe. I used EZ-sweetz, but liquid stevia or monk fruit should work too. A combination might be even better. I'm going to make some today, so I'll experiment a bit. Thanks for the input. One thing I've found when using Truvia with chocolate, is that I always powder it first in my coffee grinder. Then I don't get the graininess. I love this recipe! Yum Yum, but I have to find a way to cut it down, as it's so yummy I want to eat the entire recipe's worth all at one sitting, LOL. Judy, I don't have a 5×7 baking pan. In fact, I've never seen that size. If I wanted to use my usual brownie pans, 8×8 (or for big batches, 9×13), do you have any idea by how much I'd have to multiply the recipe? It looks so good! I used a small loaf pan. A double recipe would be OK in a regular loaf pan. Any small pan or even a storage container should work; the thickness of the candy might change, but that doesn't matter. I just made this for the first time today. Better late than never! This is my new favorite recipe. Thank you SO much for this. I used 1/2 cup Swerve and about 8 drops EZ Sweetz and it was perfect for us. You have such an informative blog. Thanks for the comment, Anonymous! I'm glad you found the recipe! I wish I had a 5×7" baking dish! never seen such a thing. I just used a standard loaf pan. I think they are usually about that size. You can use other pans, but the fudge would be a different thickness. Anonymous: you can substitute another kind of nut or seed butter, such as almond, pecan, or cashew. can I change the vanilla protein to chocolate, add vanilla extract and omit the cocoa? Thanks! Jeni, I'm afraid you wouldn't have enough dry ingredients without the cocoa. You might try using twice as much of the chocolate whey protein, but I can't promise that it will work. Why not just use cocoa? It would probably be a lot cheaper than the whey protein. I am not a nut butter fan…will recipe work without it or would another ingredient be necessary to get the right consistency? Rocketmom, You could try sesame or pumpkin seed butter or the kind of coconut butter that is made from coconut meat (not just coconut oil). Cocoa butter (the fat from chocolate) would probably work too, but I haven't tried it. Can I change the vanilla protein to chocolate, add vanilla extract and omit the cocoa? Thanks!! I used natural peanut butter, butter, and truvia as the sweetener and plain whey protein powder…. and everything as listed except I used cashews for the nuts and I absolutely loved your recipe! Greatest low carb fudge Evar!!! Thanks, Charsbeads4u, I'm so glad you enjoyed the recipe! I like that it has the texture of real fudge and doesn't taste too "peanutty."